Words direct from the Apostles... The New Testaments or New Covenant is a grouping of twenty seven different books that are thought to be written by the Apostles or their direct disciples sometime during the late first century. It is largely accepted that the original texts first appeared between 45 A.D. and 140 A.D., the century after the death of Jesus. These books were penned during the Roman occupation in several Middle Eastern countries. Most were written in Koine Greek, a popular dialect of the time. Biblica publishes a large variety of books that feature the New Testament texts. More focussed than the complete Bible, the New Testament is perfect for evangelism. Biblica has combined this text with engaging themes making many of these products perfect for reaching out to new Christians, youth groups and general community outreach. You can give away a beautifully designed NIrV New Testament without breaking the budget. These paperback editions are simple, economical, and ideal for all readers. An NIV New Testament translation in Arabic, this beautifully designed text features both English and Arabic and is a strong resource for evangelism or outreach. A lightweight, paperback NVI Spanish translation that is contemporary and accessible. Printed economically and available by the case for affordable evangelism. Easier to read, this NVI translation is designed for portability and affordable evangelism. With a presentation page, overview, and glossary, these are excellent outreach texts. A well-made paperback edition of the New Testament in Swedish, this durable paperback makes the ideal gift or mission resource. 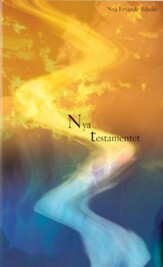 Enjoy complete clarity with this Chinese and English edition NIV New Testament. A well sized paperback, it is good for outreach and priced in single units and case quantities.